That Swedish black-clad anti-refugee Mob beating Children? Neo-Nazis. The neo Nazi Swedish Resistance Movement claims it was behind a wave of violence in Stockholm targeting homeless refugee children. Swedish police have made at least four arrests after a mob stormed the country’s capital Stockholm in a spree of anti-refugee violence. As many as 100 masked people marched through the city handing out fliers threatening to target “North African street children” and give them the “punishment they deserve,” according to local tabloid Aftonbladet. The fascist group Swedish Resistance Movement has claimed responsibility for the demonstration. 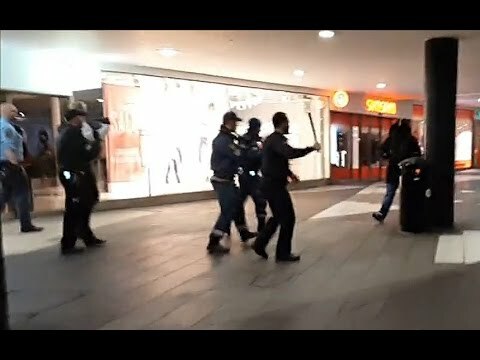 According to RT, the group has issued a statement claiming it “cleaned up criminal immigrants from North Africa” in central Stockholm. The mob has been accused of attacking anyone on the street that didn’t appear white. According to The Local, witnesses said at least three people were assaulted by the mob. “They came from Drottninggatan (Stockholm’s main shopping street) and walked down toward the square and began to turn on immigrants,” the publication quoted one witness as stating. Police have confirmed the mob was believed to have gathered “with the purpose of attacking refugee children,” according to The Guardian. The violence came a day after Sweden’s interior ministry announced plans to deport tens of thousands of migrants and refugees. The Swedish government has vowed to crack down on refugees, after receiving around 163,000 asylum applications in 2015. Most refugees heading for Europe are fleeing violence in countries including Libya, Syria and Iraq. While far right groups have claimed the refugee intake threatens local culture, newly released European Union documents suggest the bloc has barely resettled 0.17 percent of what refugees member states agreed to take in in 2015. This means more than 98 percent of the refugees included in the EU’s plan remain in Greece and Italy, the points of arrival for most people fleeing violence, war and poverty in various Middle Eastern and African nations.